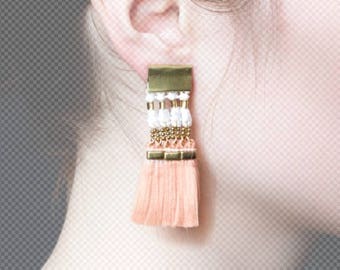 Fringe statement earrings - OCOTILLO - White lace, handmade terracotta tassels, clay & wood, brass. 70s factory girl Frida boho earrings. Announcement Welcome to This Ilk, the original lace jewelry shop! Earrings, necklaces, bracelets, body jewelry and more, handmade with love in Montreal, Canada, since 2008. If you're into vintage lace or the mod 1960's (think Edie Sedgwick) and are looking for some lightweight extraordinary dangling earrings, necklaces, harnesses... you're in the right place. The lace is hand dyed, cut and strategically stiffened when needed so the structure is kept (and doesn't unravel) and the sheen or softness of the lace remains. Most designs are limited editions due to limited sources of vintage lace. All hooks are silver or gold tone plated and they happen to be the only ones that don't give me an infection (they are nickel free) so I do recommend them... I can also provide clip-ons for anyone who doesn't have their ears pierced or stirling silver hooks for an extra 4$. *Wholesale and custom colors available when possible... Don't hesitate to ask any questions! Welcome to This Ilk, the original lace jewelry shop! Earrings, necklaces, bracelets, body jewelry and more, handmade with love in Montreal, Canada, since 2008. 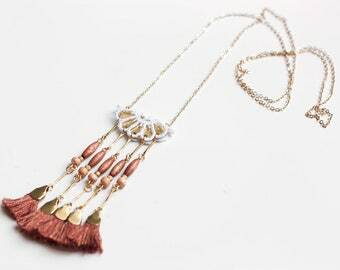 Long fringe necklace - OCOTILLO NECKLACE - White lace & handmade terracotta tassels with beads. 70s necklace for bohemian festival goers. Fringe statement necklace - IMPALA - Rattan lace, raw leather, raw brass & black or cream fringe bib necklace. African tiki wicker jungalow. So pretty, showed them to friends and they loved them. Hoping they buy. Gorgeous! So many compliments on these unique and beautiful earrings! Boho lace earrings - NIGHTSIDE - Mustard ochre statement earrings. Flower crochet earrings Tatting fabric rustic wedding Best selling items. After a bachelor's degree in Industrial Design in 2007, and a little existential questioning, I needed a change. A stroke of genius, as I soon realized that lace is to textiles what gold is to metals and diamonds to rocks and that nothing beats lightweight statement earrings! 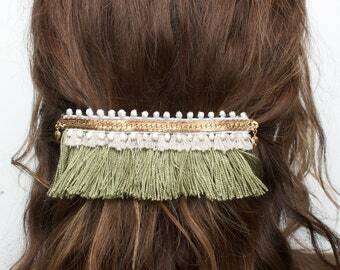 Today, the hair has grown again but the passion for statement pieces never fades. This Ilk was born in late 2008 and has come a long way since. With help from believers in my art at various stages along the way, This Ilk has managed to become my life and full time job. Working alone in my Montreal studio I developed my own techniques. Cutting, dyeing, treating the lace so it doesn't fall apart, stiffening it strategically and precisely for structure, painting and assembling the various jewelry pieces, are all part of the process. I do not cut any corners as good design and quality are what counts. Another part of the challenge is seeking out the lace, that will inspire new pieces or fit my designs, from a variety of sources (mostly vintage). Always rethinking the definition of jewelry itself, the idea of body jewelry was born when I inadvertently placed a necklace on my shoulder. Skirting the fine line between jewelry and clothing, leggings and a dress also became part of the collection. This Ilk has been featured in various magazines as well as at Montreal's Fashion week and festival. It also won a spot on the "Who's Next" trade show in Paris as well as a large grant with Incognito ( a local company) and Elle Quebec to enable me to expand my business. Following a degree in Industrial Design, Tamara founded This Ilk in late 2008 after designing her first pair of lace earrings in 2006. Inspired by all facets of design, she believes that lace is to textiles what gold is to metals & diamonds to rocks. Welcome! This Ilk is a small company I have created out of my skills as an industrial designer. Basically, I like to treat everyone how I would like to be treated, and I really like to trust people (I think it makes this world a little better). Plus, I am as ecofriendly as possible (concerning packaging, limiting waste and using low impact materials such as water-based glues and giving a second life to certain materials). If unfortunately you have changed your mind upon reception of the item, you may return it to us at your own shipping expense and we will be happy to refund the value of the item excluding the initial shipping price as this money will already have been spent. We expect to receive it in the same condition you received it in (unworn). We reserve the right to not issue a refund if we see obvious signs of wear. Feel free to use a similar packaging as we did. We favour exchanges over returns therefor we will be happy to cover the price of the new shipment sent out to you. Do note that lace or assembly may be imperfect or slightly different than pictured because there is often a human behind its fabrication and dyeing. This may not be considered damage. Treat it like you would your precious jewels, feather jewelry or delicate nylons :) I also suggest laying it flat when storing so it keeps it's shape as best as possible. Please note that we cannot be held responsible for lost packages sent out via regular mail. However, although we reserve the right to make all decisions regarding responsibility and ways to remedy this situation, we will favor replacing the item when possible and are not obliged to issue refunds. If your package seems to be lost in the mail (see shipping delay details in shipping policies) please contact us directly so we can work something out together. Please remember that this is as much a problem that we undergo as it is for you. We understand your concern and want you to be super happy with your This Ilk piece so don't worry to much, we'll figure something out ;) If you have any doubts, feel free to visit our feedback section. Note that in all cases, we do not offer refunds for delayed shipments as we have no control over delays caused by postal services and customs. We will do our best to answer your inquiries as fast as possible but please be indulgent as we are only a team of 2 and may not be available to instantly answers questions. It's pretty simple, we will treat you as we would like to be treated and as best we can to the extent of our control ! My shop accepts Paypal and Direct Checkout (debit cards, Etsy gift cards and credit cards). Items bought must be paid before they are shipped. Taxes will be applied to purchases within Canada. Please inquire if you would like tracked or express shipping, we will put up a special listing for you! Also note that we can not be held responsible in the case where an address is incorrectly spelled or incomplete on Etsy. If the item is returned to us, we will happily resend it to your corrected address for the equivalent of the shipping fees so please double check your shipping information before purchasing. We use eco-friendly packaging and try to keep the shipping weight and sizes as low as possible to have a lower impact on the environment. If you have a special request (deadlines, gift wrapping, etc.) just ask and I'll definitely make the extra effort! PS. The EU and Canada will be introducing a new trade agreement which will eliminate custom fees in October. This is a great opportunity to hold This Ilk in your shop as you would local brands!